CANVAS AND PAPER WAREHOUSE: The F.Y.I. 's Of HDR. Doing this gives the HDR software knowledge of all the different ways an image could look depending on the lighting (usually –2, +2 and normal exposure levels are used) and can create a visually more appealing image. By giving the HDR software about what the picture looks like at different exposures it is able to create an image that more fully captures what the view would have looked like in real life. Creating an image using high dynamic range imaging is a technique that enables the photographer to create an image with a full range of color and lighting by combining multiple shots. The way it does this is by capturing at least three images and combining the lighting and coloring to match what a human eye would capture. It captures one above, one under and one at normal exposure levels. As is visible here, the combination of the three images can create a more visually and striking image. However, this technique is only appropriate in some situations. If overused HDR combining software can create over-saturated images that look fake. As you can see in the image to the left, it is easy to visualize how one of the non-normal exposure shots could dominate the picture. If the colors were much brighter on the overexposure shot, it would create unrealistically bright streaks in the final image. If you are shooting a shot of moving things HDR will create a blurry streaked image. It works by combining the images and if the object is moving, it will not be in the same spot in all the images. The software will try to combine the image, but it will be blurry as it is not in the same spot in the pixels in all the images. Another thing to keep in mind when utilizing HDR software is the initial lighting where you are shooting. If it is a dark place but you want more color then would be seen, multiple over-exposed shots should be used and only one at underexposure. 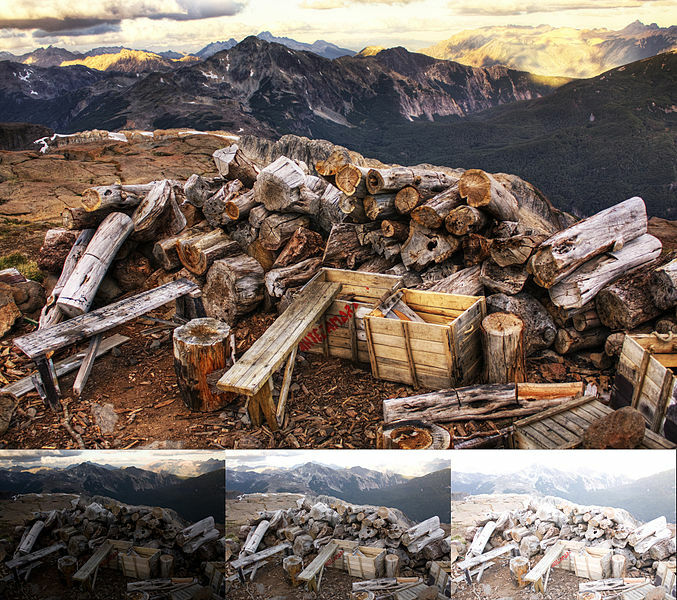 The final step in HDR imaging is the choice of substrate that you are working with. If you really want a quality print from the file, a quality canvas or paper is needed. You will most likely be printing with a professional grade printer and will want a substrate that can reach the same levels. We would recommend our premium gloss canvas or a velvet rag archival quality paper. These both are high quality, durable substrates that will last for a long period of time and have the widest possible color gamut.